Collier Child Care Resources is part of Future Ready Collier, a collaborative network of community members, organizations, businesses and schools working to ensure every child in Collier County is ready for Kindergarten and every young person enters adulthood with a vision and a plan to accomplish that vision. Future Ready Collier is the Collier partner for the regional FutureMakers Coalition. 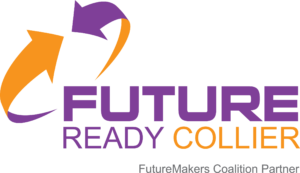 Visit www.FutureReadyCollier.org to learn more and get involved. Many early childhood teachers today rely on federally funded programs to pay their bills, seek medical attention, and even feed their families. In their most recent work, Whitebook, Phillips, & Howes (2014) state that 46% of early childhood workers on a national scale rely on food stamps and welfare for support. For every child’s teacher in his or her life between the ages of 0-5, half of them rely on government programs in order to survive. In order to initiate change, we have to advocate for ourselves as early childhood professionals, and for those whom we know, love, and trust with our children’s future. There are few, if any, policies in North Carolina supporting the pay for early childhood professionals. We know that parents cannot afford to pay more, as tuition rates have steadily increased over time. However, the best teachers can’t afford to stay. If we are buying into the idea of getting our children ready to enter the school system at age 5, we have to buy in to supporting early childhood wages, as well. HOW DO LOW WAGES DIRECTLY AFFECT CHILDREN? One would argue that when a child is stressed, he or she will show it in the classroom, so we should also agree that when a teacher is stressed that it will affect the classroom, as well. We have a tendency to think of quality as materials, a nice environment, and the ability to achieve all of the standards set forth by the governing systems over child care. The one component that is harder to capture, is teacher-child interactions. We could set up a room with an endless supply of toys and books, counters that are sanitized properly, and diapers that are regularly checked, however without an engaged, loving, and supportive teacher involved we are leaving our children to chance. When looking at the impact of teacher disposition upon quality, Whitebook, Phillips, & Howes (2014) looked at the commonalities among early childhood workers in order to connect the stressors to a source. Of the early childhood educators that are also parents, 57% worry about simply having food on their table (Whitebook, Phillips, & Howes, 2014). Stress levels directly affect the ability of a teacher to provide high quality care in the classroom. An early childhood teacher who is struggling to choose between keeping on the power or taking their sick child to see a doctor cannot possibly provide the quality of care that we expect in the classroom. It is time for us to stand up and ask for support.